As of late, ICSOM Chairperson Bruce Ridge has been on the road quite a bit representing ICSOM and visiting numerous ICSOM orchestras. Of course, that’s not unusual for Ridge. When one realizes that his own orchestra, the North Carolina Symphony, has one of the busiest travel schedules in the country, one further appreciates the (literal) distance he goes for ICSOM. ICSOM Chairperson Bruce Ridge visits with musicians of the Virginia Symphony backstage at the Sandler Center in Virginia Beach on April 7. Ridge returned in May to meet with the full orchestra in Norfolk. Just some of his travel during the last year on ICSOM’s behalf includes a trip to Buffalo to visit with musicians of the Buffalo Philharmonic, attending the FIM International Orchestra Conference in Oslo, Norway, an ICSOM Governing Board meeting in Chicago, a trip to Miami to meet with the New World Symphony, going to Tampa Bay to visit with musicians of the The Florida Orchestra, meetings with the ICSOM Media Committee, going to Reno, Nevada to meet with the AFM International Executive Board (IEB) at the AFM Players’ Conferences Council (PCC), a trip to Minneapolis to visit with the Minnesota Orchestra, a visit with musicians from the Virginia Symphony, an excursion to see musicians of the Philadelphia Orchestra, as well as recent trips to Pasadena, California, Halifax, Nova Scotia, and Fort Worth, Texas for the conferences of the Regional Orchestra Players Association (ROPA), the Organization of Canadian Symphony Musicians (OCSM/OMOSC), and the Theatre Musicians Association (TMA), respectively. During an April trip to Philadelphia, ICSOM Chairperson Bruce Ridge (right) meets with Philadelphia Orchestra musicians backstage at Verizon Hall at the Kimmel Center for the Performing Arts. 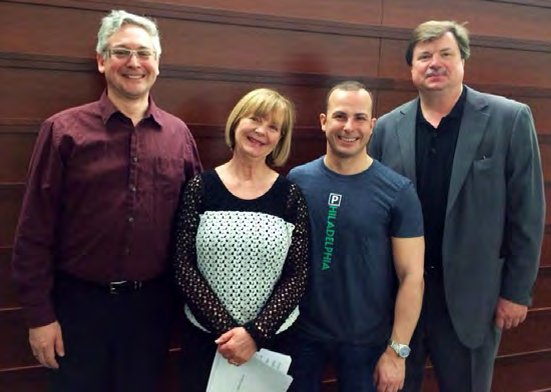 Also pictured are (left to right): ICSOM delegate John Koen, musicians’ chair Gloria dePasquale, and Music Director Yannick Nézet-Séguin. 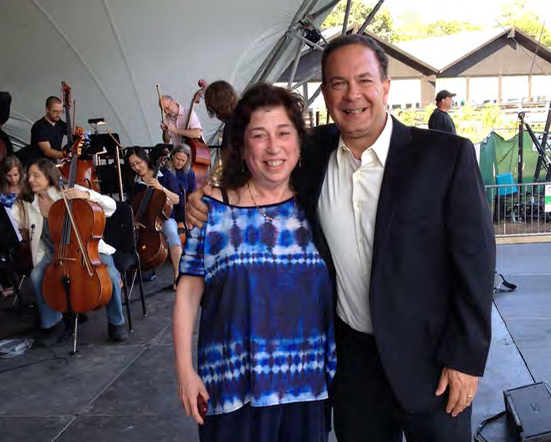 Ridge also met with Local 77 President Joe Parente and members of the orchestra’s management. 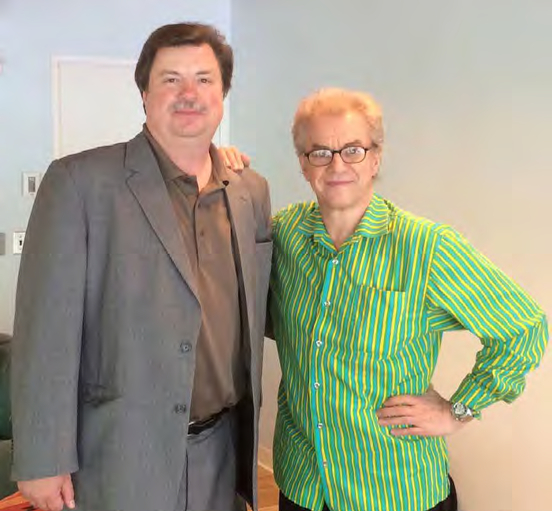 ICSOM Chairperson Bruce Ridge (left) and Minnesota Orchestra Music Director Osmo Vänskä. In June, Ridge travelled to Minneapolis where he also met with the full Minnesota Orchestra, Local 30-73 President Brad Eggen, the new Minnesota Orchestra board chair, and many supporters within the community. The Chicago Symphony Orchestra announced that it had received two of the largest donations in its history: a $17 million gift to endow the Music Director position, and a $15 million gift to create and sustain connections to music for individuals and communities. Both gifts were acknowledged publicly on the same day and included funds for both the CSO’s endowment and its general operations. The $17 million donation is a gift of the Zell Family Foundation, funded by CSO Trustee Helen Zell and her husband, Sam. The $15 million donation is from the Chicago-based Negaunee Foundation. To honor the Negaunee Foundation’s support for the CSO’s Institute for Learning, Access and Training, it will be renamed as the Negaunee Music Institute at the Chicago Symphony Orchestra. These two major gifts cap President Deborah Rutter’s tenure with the CSO. In September she will move on to the John F. Kennedy Center for the Performing Arts as its president. The Chicago Symphony Orchestra will also see the departure of its vice president for artistic planning and audience development, Martha Gilmer. Gilmer will head to the San Diego Symphony on September 24 to start a three-year appointment as its new CEO, succeeding Edward “Ward” Gill. The Lyric Opera of Chicago recently announced encouraging news about the state of opera in Chicago. Ticket sales for 2013–2014 increased 8%, pushing the Lyric Opera into the black for the 26th time in the past 27 seasons. Ticket revenues soared to $28.8 million from the 284,440 tickets that were sold. Perhaps even more impressive, though, is that nearly one-fourth of those tickets were purchased by first-time Lyric Opera buyers. Equally impressive was the turnout for the Lyric Opera’s production of The Sound of Music, which made it the top-selling production in Lyric history. That production alone was responsible for about two-thirds of the season’s first-time attendees and 25% of the season’s tickets. During its more traditional offerings consisting of 67 performances of eight operas, the Lyric Opera drew audiences at an impressive 85% of capacity. According to General Director Anthony Freud, another strong point of the season was creative consultant Renée Fleming’s taking on an expanded role as advisor for the Ryan Opera Center. Fleming will also spearhead Lyric’s collaboration with the Chicago Public Schools to restore the arts as part of the core curriculum (in collaboration with Yo-Yo Ma and the Chicago Symphony Orchestra). Jane Chu is the new head of the National Endowment for the Arts (NEA). The NEA chairmanship had been vacant since Rocco Landesman left in December 2012. At the 2013 ICSOM Conference, delegates passed a resolution urging President Obama to appoint a new NEA chair immediately. Chu was nominated in February, confirmed by the Senate on June 12, and assumed her duties on June 30. Before moving to the NEA, Chu was president and CEO of the Kauffman Center for the Performing Arts in Kansas City, home to the Kansas City Symphony. Michigan, the summer home of the Grand Rapids Symphony.